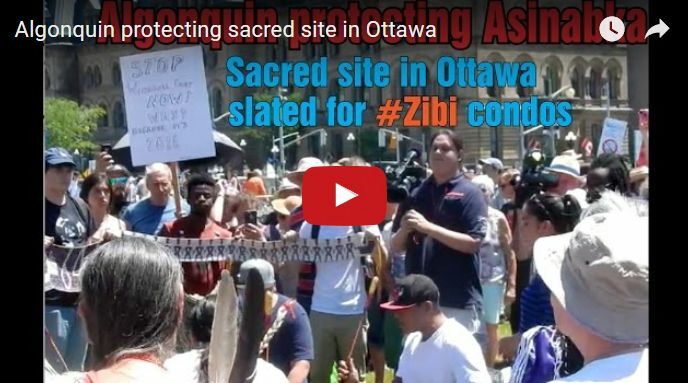 A new video features the heartfelt words of Algonquin elders and their supporters who are opposed to the Zibi condos planned for the sacred site, Asinabka. Included in the video are Jeff Westeinde, Windmill Development Group; Romeo Saganash, New Democrat MP; Mariah, Kitigan Zibi Anishinabeg community member; Elder Albert Dumont of Kitigan Zibi Anishinabeg; Lynn Gehl, Algonquin Anishinabe-Kwe scholar and activist; master of ceremonies Maurice Switzer; and Evelyn Commanda, daughter of the late William Commanda of Kitigan Zibi Anishinabeg. Meanwhile, on June 27, Ottawa activists and Algonquin community members marched to the constituency office of Catherine McKenna, Minister of Environment and Climate Change, to demand that she take a stand against the condo project. She is the M.P. representing Ottawa Centre, where the islands are located, on unceded Algonquin territory. The Minister, to her credit, listened to what protesters were saying and responded she would “work with the community to find a good outcome.” National coverage of this event appears on Rabble.ca. Among those quoted in the Rabble article is Lynn Gehl, an Algonquin Anishinaabe-Kwe scholar and activist who carried a huge sacred pipe to the Minister’s office. The minister “was putting out a lot of rhetoric…Domtar and the NCC and Windmill, they’re going to develop a sacred place, and that’s a terrible thing to be doing. In the context of reconciliation and nation-to-nation, you don’t develop an Algonquin sacred place. “We’ve been waiting 250 years. We’re sick and tired of your diversity of views, and we’re sick and tired of your discussion. We want you to stop the development of our land. We want our land back,” Gehl said.